I like to think of myself as a pretty tech savvy guy, but I have to admit the first time I flew a drone over a vineyard a few years ago it didn't go so well. Within seconds of getting the Unmanned Aerial Vehicle (or UAV) off the ground, a wind gust sent the quadcopter spiraling out of control into the vineyard below. Not only did my on-board camera take a beating, the drone’s blades made fast work of the summer canopy and harvested a handful of developing grape clusters along the way. So goes new technology in the field. But tech has always had its place on our farms (think tractors, GPS, Radio frequency identification, irrigation systems and variable-rate technology), and “smart” precision tools and software are definitely making their mark on California agriculture. Here on the Central Coast, a fourth year of drought has thrust “smart” farming into the spotlight with events such as the first-ever Forbes Reinventing America: The AgTech Summit, coming to the Salinas Valley on Wednesday and Thursday. And we’re going to need a lot more of it if we’re going to feed an estimated 9.6 billion by the year 2050. Real-time data is the key for agriculture, as growers need tools that will help optimize the processes they’ve been following for years to maximize crop health, production and yield with fewer inputs. “Smart” technologies can help do just that, providing farmers with weather, soil moisture and crop stress data in real-time thanks to the development of wireless systems and mobile devices. 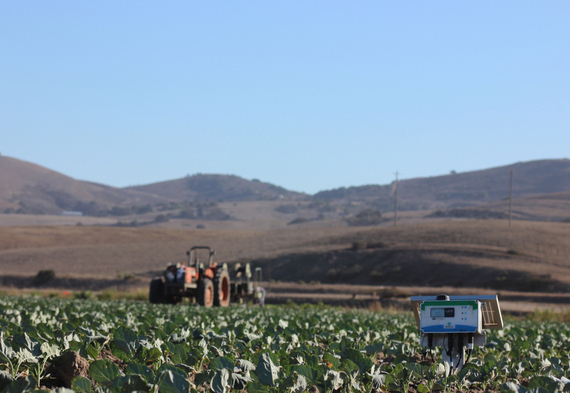 Because agriculture is all about measurement (pounds, bushels, acres), sensor technologies have seen quicker adoption in the Salinas Valley versus some other precision ag technologies such as satellite imagery and drones. It also helps that hand-held soil moisture monitor tools and tensiometers have been around for decades. But “smart” versions of these tools haven’t been available until more recently, and adoption could skyrocket thanks to smart-phone technology and applications. That said, “smart” technologies aren’t being adopted as fast as they could be in the field for a number of reasons. One being many precision ag technologies are based on yield and other data from years past, or satellite imagery that is days or even weeks old. That information is helpful in planning the season (choosing the right crop hybrid, planting density, and applying fertilizers at a variable rate), but once the season starts growers really need management data at a smaller spatial scale - to the square foot, rather than the square mile. Another reason for slow adoption rates stems from the fact that most “techies” aren’t “aggies,” and are less versed with the issues growers are grappling with on the farm, with labor shortages, water cuts, and the roller-coaster market prices that take growers for a ride almost every season. “Farmers are conservative, because some only get 40 shots at a crop in a lifetime,” Bigman said. “There’s no more entrepreneurial job in the world than being a farmer. To their credit, they’re willing to try so many new things. For technology to be adopted on the farm, reports have shown technology needs to be proven and easy to use, not only for farm managers but workers in the field as well. “Adoption of smart farming solutions is strongly driven by the ‘ease of use’ feature,” says Beecham Research principal analyst, Saverio Romeo, co-author of a report called Towards smart farming - Agriculture embracing the IoT vision. “Farmers want plug and play solutions. But, farmers also want to see the ROI (Return on Investment). All of which stresses the importance of having accurate, real-time data technologies on the ground, so farmers can use that data proactively to cut back costs associated with labor, water, energy and fertilizer. While all of us in ag can agree, “the more you know, the better you can plan” for the season, it’s become clear that - even during today’s technology age - on-farm tools are still needed to calibrate and deliver easy-to-decipher data if growers are going to succeed in season.